Kinsale Further Education College in south west Ireland hosts a number of courses, including Europe’s first 2 year full-time permaculture design course, as well as a Drama and Theatre Performance Course, sculpture, film, art and photography courses. 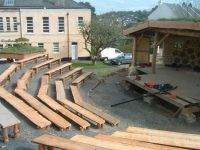 The idea began to arise over the last couple of years of building a purpose-built performance space for the college’s drama students as a collaborative project between the permaculture, drama, sculpture, painting and film courses at the college. During the students’ permaculture design projects, (where they do a permaculture design for the college grounds), a site was identified as the ideal spot to put such a structure. It was, at that time, home to a rather unattractive and underused bike shed, in a rather precarious state of disrepair. To get the project rolling we hosted a design morning, where we brought together drama and permaculture students, put them into mixed groups, gave them each a lump of clay, and asked them to design a naturally built amphitheatre. They also made use of sticks and grasses and things they found around the classroom and outside, and some of the models were amazing. It served as a very useful exercise for getting them to start thinking about how such a space might work, and also brought students from different courses together in a very collaborative spirit. The concept that emerged was for an amphitheatre, built using almost entirely local materials, and using techniques that were easy for the students to pick up. We decided to use cob and cordwood, as it gave the opportunity to teach two techniques simultaneously and also because it is a technique with a lot of potential for Ireland, but where much more research is needed. I have always viewed the work we do in the college as being a great opportunity to build structures in ways you might not do for a client, we are able to take more risks and be more experimental here, which has great implications for the wider community. 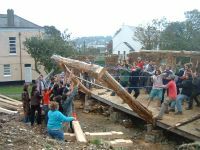 The building was also to bring people into the college from the wider community, to see a play, but at the same time allow us to expose them to many ideas from permaculture and natural building, but in a very experiential way. The permaculture, as it were, would be coming in ‘under the radar’. People would come for a night at the theatre and go home marvelling at the possibilities of natural building and permaculture design. We wanted to build something that would really become a landmark structure in the town, and that would raise the profile of the college. Next, in collaboration with the drama teacher and the Principal, I drew up some rough drawings for how this building might work. Once we had reached a consensus as to how big it was to be and its general design, we began to work on it. The first thing to be done was to remove the existing bike shed. This was launched into with great gusto by the students, and most of the materials came off in a way that could be reused. We then cleared the site. 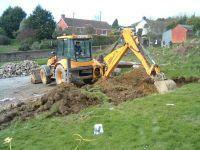 Liam, the caretaker, using a JCB, levelled the site and made the banking for the seating in the amphitheatre. Once this was done, we began to make the foundations. Dave Griffiths, a very skilled local drystone waller, came in to teach the students drystone walling. 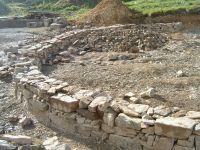 The foundation wall was built by the students over a few days, using local stone from a quarry just outside Kinsale. They picked up the skills involved very quickly, and the wall contains some beautiful stonework. Plinths mortared together with lime were also built, to support the main structural timberwork. The main framework for the stage was then put into place, using local larch from a nearby sawmill. The ‘backbone’ was of 9�? by 3�?s, with 6�? by 2�?s over that, and then with 6�? by 1�? boards forming the decking. Once this was in place, we began to mix cob, which secured the boards in place. The cob was made using subsoil from a building site at the top of the hill, which the builder sent down to us in dumper loads whenever we needed more. It has good clay content and was easy to screen. The soil was put through a large screen, and then mixed by foot on tarpaulins, to produce a very nice cob. We needed to add a small amount of sand as the clay content was slightly on the high side. 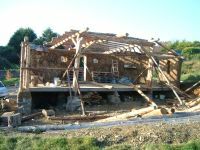 The cob was built around the timbers, which firmed up the whole thing and gave us an even base all the way round for the cordwood to begin. 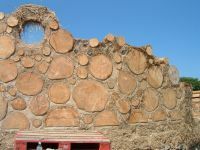 The wood for the cordwood came from local forestry. Sitka spruce poles can be easily sourced if you want to buy a truck load. In terms of using this building for research, we felt that if sitka spruce would work and form a durable cordwood wall, then for us in Ireland this would be fantastic, as we have many many thousands of acres of sitka spruce in Ireland with no obvious end use. We didn’t, unfortunately, have the luxury of seasoning the poles for a year beforehand, as is the ideal state of affairs for cordwood. Students stripped the poles by hand using drawknives, and these were then cut into logs of roughly the same lengths with a chainsaw. For the cordwood building we placed the logs onto a bed of cob, with cob ’sausages’ coming a quarter of the way into each log, with the central section being filled with the clayey gravel that didn’t pass though the sieve. This made a very solid and sound wall. If we had been building a structure that we would actually live in, a more insulating infill, such as hemp or sawdust would have been used. When you are building like this, your cob goes much further than in a pure cob wall. Also, unlike pure cob building, you don’t have to wait for each lift to harden before you can go up again. With cobwood, you can just keep going. Students were encouraged to keep checking that the wall was plumb, and also to make sure that the logs stood about ¼ “ proud of the cob, and also to pay attention to pointing the wall well with a butter knife. This meant much less shrinkage cracks in the final wall, a much stronger wall and also gave it a very attractive finish. Helped by roundwood pole builder Saul Mosbacher, we carried on building the walls through April and May, and by the time of the summer holidays, the walls were about half way up. One of the problems with running a permaculture course during college term time, is that at the time of year when everything is growing and the weather is dry for building, everyone is on holiday. Traditional cob builders always say that you should only build with cob “from when the swallows come to when the swallows leave again�?. This is because the deeper you get into winter, the slower and slower the cob dries. When the new intake of students resumed work on the amphitheatre in September, the drying had already begun to slow. We were also aware that winter was fast approaching, and that there was a considerable urgency to get the roof on as soon as possible. We therefore focused on getting the walls up, and over 3 weeks we got the walls up to wall plate level. Unfortunately, one freestanding section of cob wall didn’t really like being built so fast, with wet cob on top of wet cob on top of wet cob, and it began to lurch sideways quite precariously. We decided that we would push it over and frame it instead, and make wattle and daub infill panels. It actually ended up looking really good, and the students got to add another technique to their natural building tool kit. Once we had reached the wall plate level, we began work on the roof. Using hand peeled roundwood poles, Saul made the main henge frame for the front of the stage. The wood for this came from a family who lived directly over the road from the college, who had had to fell 4 pine trees, and asked us if we wanted the poles for use in the building. We said we would love them, and with 25 students, we carried them over the road to the site, with 2 students stopping the traffic! Lifting the henge into place was quite an undertaking. We tried it once with all the first year permaculture students, around 30 of us, and we couldn’t do it. We went and gathered the second year permies as well, and with the combined muscle power of about 45 of us, we heaved the frame up into place. Once that was up, we started to add the other poles, and gradually the roof took shape. Once all the beams were fixed, we began to board over the top, using 6�? by 1�? boards, many of which were reclaimed from a nearby glass factory, being the crates that the glass was imported in. The factory were delighted that someone would take them away and that they wouldn’t have to burn them all (as they had been doing up to that point). The students ripped them down into individual boards and these were nailed up on the roof. We then fixed larch fascia boards around the edge of the roof, and on top of this we placed old carpets, and then strong plastic sheets, and then more carpets (a ‘carpet sandwich’ as it is known). On top of this we placed turf. We extended the stage at the front to form a ‘thrust stage’, and did some ornate clay plaster work onto the cob. Time pressure was starting to build – by this stage the drama students were getting geared up for their production of ‘The Merry Wives of Windsor’ so the theatre needed to be completed in time for the show the second week of May. For seating we terraced the bank and built wooden benches on the tiered slope. We gravelled the ground around the theatre and limewashed the walls, using a yellow ochre pigment. We also asked the sculpture students to make some clay gargoyles, which could be fixed onto the walls at various places, gurning down at passers by. The gargoyles they produced added a lovely finishing touch to the building. The final touch was to build a pizza oven at the entrance to the theatre, covered by a reciprocal frame roof, so that when the audience arrive in the evening they are welcomed by a fire, and then during the interval they can eat pizza made in the stove. Again, more permaculture coming in under the radar. Finally, at the beginning of May, we had finished. It had seemed like a huge task to take on but we had made it. The finished theatre is an amazing achievement. 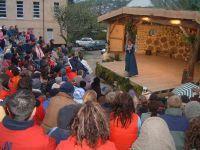 ‘The Merry Wives of Windsor’ ran for 4 nights, the final night being the formal opening of the theatre. I was away until the last night, but it turned out to be an event that was so magical that it will stay with me for years. The drama students were expecting around 100 people, in the end over 200 turned up. The seating we had built and struggled to visualise with people in was absolutely packed. Extra seating was made using chairs from the college, the seating area was rammed full of people, with people standing around the back as well. There had been concerns that it might rain (it didn’t rain on any of the 4 nights), and it was quite cold, but people were prepared and came with sleeping bags, blankets, woolly hats, thermoses of hot tea, they were determined to experience the whole thing! Also, being squished in together helped to keep people warm too. The stage looked amazing lit, it had all been dressed with foliage and looked gorgeous. The evening began with the Principal of the college, John Thuillier, welcoming everyone and saying how delighted he was to have the theatre built at the college. I then said a few words about the experience of building it, and talked about Andrew Long, a student of the course who had died 2 years previously, for whom we had made a memorial plaque in the theatre. Andrew’s father came onstage and cut the ribbon to formally open the theatre, which was dedicated to Andrew. It was a very touching moment. Belinda Wild, the drama teacher then introduced the play and we were off. The play was amazing. One of Shakespeare’s lesser known comedies, The Merry Wives is a farce with lots of rude jokes and misunderstandings, all of which the actors carried off with great skill. It so suited the stage, and the drama students’ concerns that they would be upstaged by the theatre were unfounded. We made pizza for the interval (for 200 people!) which helped to warm everyone up a bit. When the play ended, the applause was amazing. There was a standing ovation which went on for ages. It was such a magical event; people were really touched by it. So many people said how much they had enjoyed it and what an unique and wonderful theatrical experience it was. This project has been a great success. We have succeeded in building something that has generated a lot of interest around the town, and which can be used for a wide range of purposes. The students have learnt a wide range of skills, have seen a natural building project through from start to finish, and have created something very beautiful. This is part of the power of natural building, we can create spaces that could not be created with more conventional materials, this structure would not have the same feeling and magical quality had it been built of concrete blocks. That for me is the key word, magic. The building has a quality that melts most people’s hearts, and seeing it used for performance and the effect it had on the audience was very touching. I feel that in developing permaculture solutions, be they gardens, buildings or woodlands, what really sells these things to people is the sense of magic they create. People need to be able to feel that sense of magic, most already feel instinctively its absence from so much of modern industrial life. That is so much more important than arguments about by how many degrees global warming is increasing or whether we even call it permaculture or not. This stuff should touch people, as, once touched, there is no way back.